W. Laurence (Larry) Calhoun received his wings on Thursday morning, January 17th while surrounded by family at home. He was the cherished husband to Kathy and proud father to Patrick (Missi). Larry was Poppy to Maxwell, Olivia and Grace. He was born January 26, 1945 and grew up in Royal Oak, Michigan, the first son of Wally and Betty. By the time he was in his early teens, Larry excelled in shooting. It was typical for him to strap a .22 to the handlebars of his bike and ride through town to the city dump to shoot rats. Larry won a spot on the Junior Olympics team for archery and would later hone his shooting skills with the Michigan State Police. Larry had early aspirations of becoming a general surgeon, starting out as a doctor’s aide in Royal Oak’s Beaumont Hospital where he met the love of his life Kathleen Watts, a young nurse’s aide. While at Beaumont, Larry also took positions with the area police dispatch and with a company that worked for General Motors drawing cars. In the hospital, he treated a man who worked in the overhead crane industry who suggested that Larry maybe take his love for engineering in that direction as a career path. In the fall of 1972, Larry relocated with his family to Chagrin Falls, Ohio and started working at Cleveland Crane & Engineering, mostly in the Cleveland Tramrail division. The company was a leader in the Material Handling industry and he quickly rose to become a District Manager, providing much-needed “adult supervision” to a wide dealer network. His dealers relied on him to make the systems they sold actually work. Larry gained the well-deserved national reputation as the ”go-to” man for hot metal delivery systems of which he was heavily involved with until his passing. He would design, build and install some of the hardest working hot metal delivery systems in the country and earned the respect of all whom he worked with. In 1984, along with two partners, he purchased the Ely Crane & Hoist Co. in Cleveland. The small company quickly carved out their niche in the very competitive local market. Hard-working facilities such as Ford’s Cleveland Casting Plant and Waupaca Foundry’s many plants quickly recognized his talents and began to rely heavily on Ely for their day-to-day production. Larry forged enduring relationships with both customers and vendors to overcome many unique challenges and provide some of the most practical, innovative and durable systems in-use today. In his teens, Larry took up the banjo. While studying at Wayne State University, he became involved with the local music scene and played with such legends as Mississippi John Hurt. The banjo came to help define him and would take him from local jam sessions to bluegrass festivals near and far. Back in Chagrin Falls, he would give lessons through the Valley Art Center and over the years would be asked to play countless local events. 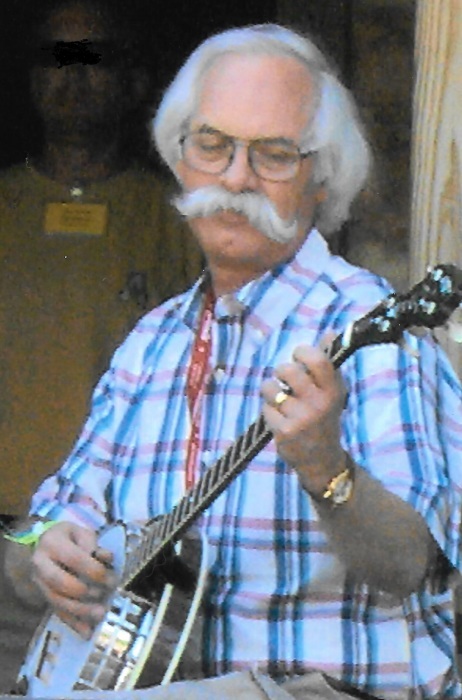 He became known throughout the Valley and surrounding areas as The Banjo Man. Larry would become a fixture in the jam sessions at Goose Acres, the Izaak Walton League and Friday nights at the Lafayette United Methodist Church in Medina. In the 1990’s, Larry found MerleFest, an annual music festival in North Carolina. There he began friendships that he would enjoy for a lifetime. Larry represented Ome Banjos in the Vendor Tent, where he would offer advice on all-things banjos and provide endless demonstrations. Strangers whom he’d helped would often seek him out years later to thank him. A crowd would always gather. Heavy-hitters from the main stage would often walk through, many stopping to listen, talk or even play with him. He appeared on-stage a number of times in a ‘tweener set’, playing between acts while showing off the latest from Ome. Larry exuded character and gained friendship with all types. His politically-incorrect sense of humor was contagious and as legendary as his mustache. He travelled in many circles and while humble, was a leader in all. Larry loved politics, history, trains and aviation. He would become a well-respected member of the scale-model community where he would focus on radio controlled WWI biplanes and HO Scale trains.